Forums » General Discussion » Home Theater » Emotiva XMC-1 (Finally) Ships! 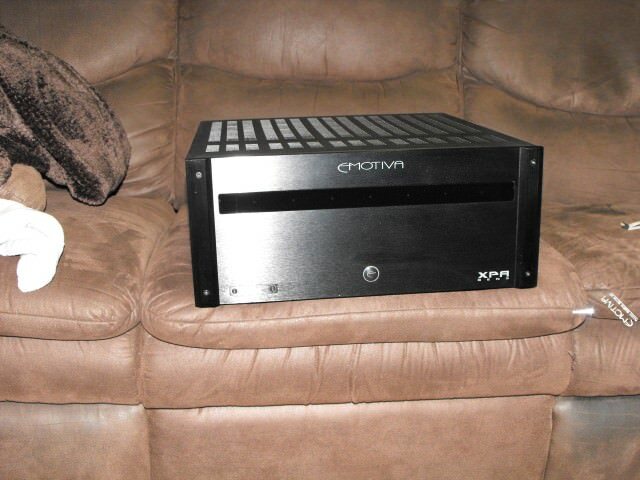 #406324 - 07/25/14 01:28 PM Emotiva XMC-1 (Finally) Ships! I've been planning on eventually getting a new pre-pro for a while and have been anticipating the Emotiva XMC-1 as a potentially good option. I finally found a post in the Owners forum on AVS from someone who has received one! The initial report is that the sound quality is very good and there were no real issues with the unit. A good step in the right direction! Until Axiom has any product in this area this may be worth considering, although admittedly it is significantly more expensive than a bunch of AVR's. I too have been following along over at emotive -- and as you say it has finally shipped after 5 long years. Given Emo's record I will not be purchasing the XMC-1 until it has dirac installed and working. Even though I don't really care one way or another about room correction I will not buy something that is hobbled and unsellable should I not keep it. All I have read so far is feedback from fanboys and that's just not enough for me . Emo has made promises before and not followed through so I will remain skeptical but intrigued. I went with the Marantz 8801, pretty much the same price and a reliable brand. I looked hard at the AV8801 but here in canuckville cheapest I could find was 3600.00 which is above my pay scale. I just got a 40% upgrade card for 200 bux so that will save me 800.00 if and when I buy one. As for Atmos , I personally am not interested in it so I am ok with that. I really hope the XMC-1 is was good as they say because I just want a basic processor without too much window dressing ,plus I like the idea of the PEQ. The UMC 200 is already works with REW and hopefully the same will happen with the XMC-1. Its not made in Canada but it is made in North America. Also it has those pretty blue lights to go with my amps. I just listened to the latest podcast and since the XMC-1 is made in the USofA it comes to us canucks duty free. That sweetens thing considerably , now if the damn dollar would rebound just a wee bit. My 8801 looked brand new. perfect from a cosmetic perspective. Also, the unit has worked flawlessly since day 1. I've also bought a NR1604 from accessories4less this year as well. Over the years i have bought several products from this company. They have all been in like new condition, and i've never been able to differentiate between these products and an "off the shelf" product. I'd have no hesitation in recommending something from them. I bought an AVR from them two years ago. It looked like new but had functioning problems. I returned it for a second unit. It had a dent and dings but functioned perfectly. I kept it. I don't understand the hype over Emotiva products ESPECIALLY in terms of their processors.